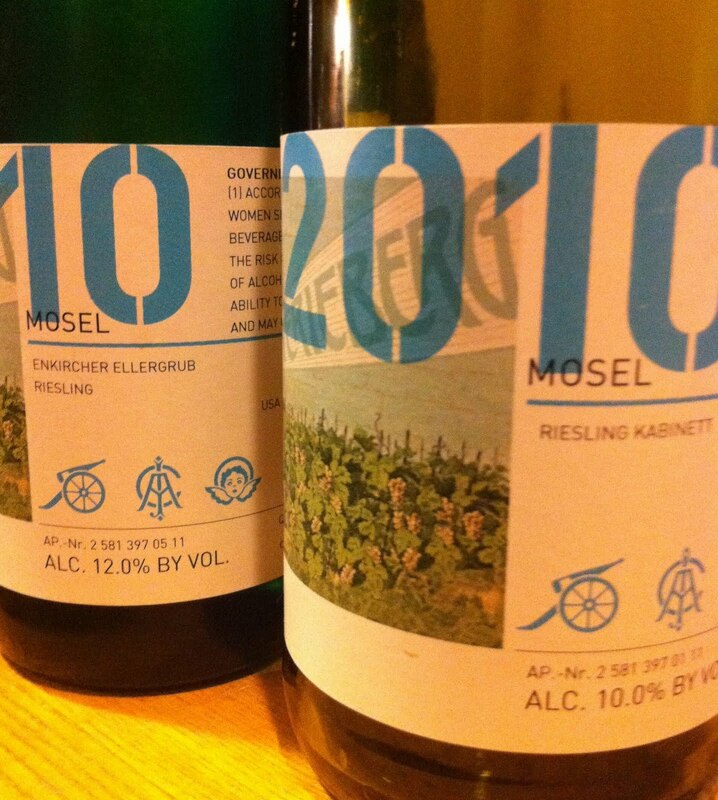 What they're saying about high acidity in the 2010 Mosel Rieslings...I think they're not exaggerating. Last night I had dinner with a few friends, including Dan Melia of Mosel Wine Merchant. Dan is my very good friend, and even though there is a potential conflict of interest here, as I want him to do well in his business, I think you know by now that I would never write about something and say that I love for any reason other than that I really love it. 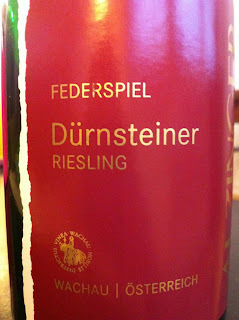 We drank many interesting wines, among them three wines from the 2010 vintage by Immich-Batterieberg. We drank CAI, the "entry level" wine in the portfolio, although it is patently absurd to think of this wine in those terms. 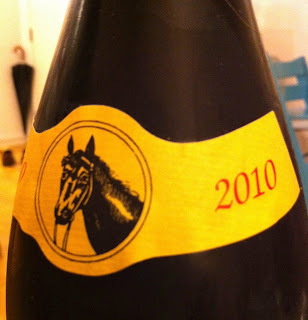 It is a Kabinett, it is very serious wine, and it is completely delicious and compelling. I loved it in 2009 and to me it seems as though the 2010 will be even better - more focused and precise, more mineral, more of everything, including balance and harmony. At about $23, this is something to buy a lot of. We also drank the single vineyard wines Batterieberg and Ellergrub. I still do not have the Riesling context to say anything intelligent about them, other than that they were also very delicious. For what it's worth, I heard people at the table crowing about Batterieberg and how perfect a wine it is, how it is so pure that it "tastes like nothing." Trust me, this was said with the greatest of admiration. These wines will cost more than CAI, but I'm not sure how much more - perhaps $50 a bottle. We opened many wines, more than might be wise on a school night, and I'm pretty sure that everyone went home with something to taste in the following days. Just now I was just making a quick dinner after a long work day, and I poured myself a small glass of both CAI and Ellergrub to taste them after 24 hours open. Still delicious, profoundly so. The point of this post, however, is to tell you that my teeth, after just those two small glasses before dinner, feel exactly as they did after a day of tasting vin-clair in Champagne with Peter Liem! Sensitive, painful to chew even a small bite of red pepper, as though they had been stripped of their enamel. These 2010's...no shortage of acidity here. I see this as a very good thing. Learning Enough to Know That I Don't Know Anything. "I've learned enough to know how much there is that I don't know." This is an idea that I firmly believe in. When delving deeply into a complex topic one can reach this point that is both exciting and frustrating where one gains new appreciation for the body of experience and knowledge that exists. Regarding wine, I hit this point some time ago. The thing is, years later, many experiences later, I'm still here. 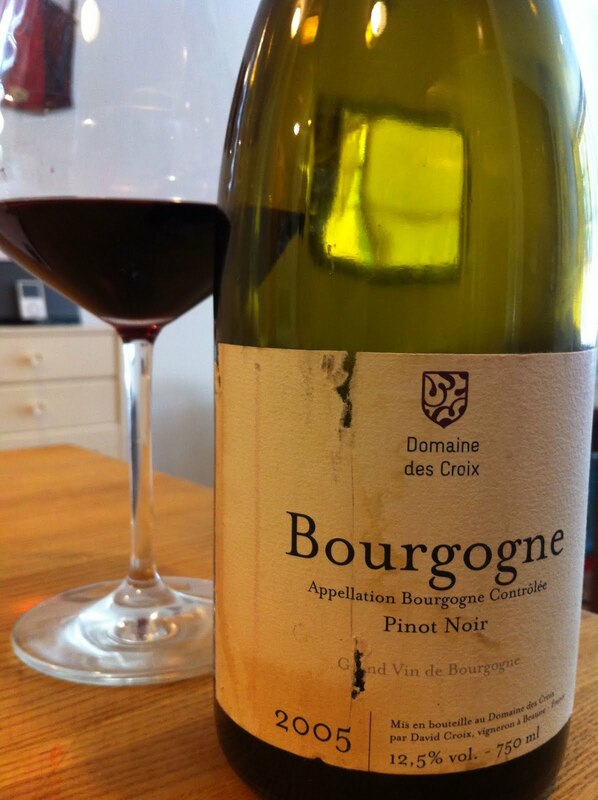 2/9/2008: up there with the very finest Bourgogne i've ever had. wide aromas of red and dark fruits, lots of earth, dark flowers and a mineral core. lovely medium bodied palate echoing the aromas with really persistent flavors on the finish, and a cool minty sensation. just great wine and a Bourgogne, no less. I am seriously tempted to explore the 1er Cru wines by this producer in this vintage. 2/11/2009: Not ready yet, and probably needs another 3-5 to integrate, if it's going to. The wood is pretty overpowering now. good underlying materials, but hard to discern the nuances of the wine right now. I wonder...will it be able to integrate all of the new oak? 11/2/2010: Oak oak oak oak. and i'm not at all anti-oak. this is not a judicious use, however. perhaps he got excited about the 2005 fruit and threw everything he had at it. in any case, even late on day 2, it's difficult to separate the wine from the vanilla influence of oak, and to see what its personality is. frustrating. 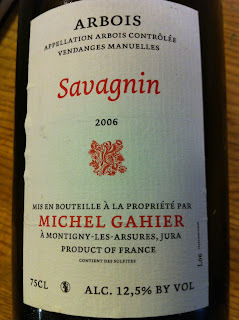 9/17/2011: a very good bottle, showing the power and depth of the vintage, and also detail of fruit and mineral. there is some oak but it is not intrusive here. There is also a definite sense of place - the wine is made from plots formerly classified as Pommard and Volnay villages, and the wine reminds me of those places. oddly, it doesn't hold up so well on day 2, very curious. I had several experiences with the wine, and formed several opinions. Which of them is true? You know what - I think they are all true. I was a different taster in early 2008, and the wine changed too. All of these notes reflect one thinking person's real experience with this wine. If someone asked me today to write a review of 2005 Domaine des Croix Bourgogne I would say that it has good qualities, and it has qualities that had concerned me, but a recent bottle was very good. I would say that in the context of regionally classified Burgundy, I was disappointed with this wine for a few years, but a recent bottle was very encouraging. Would that kind of review satisfy you? Imagine having to review this wine for a magazine or some sort of publication, having to score it based on one experience in 2008. Or 2009. How can one bottle of a wine, never mind one sip and spit at a tasting, provide sufficient information to assign the wine an absolute rating, a set of tasting notes that readers should accept as truth? If I am the reviewer, it is clear that one bottle is not close to being enough. --I drank a bottle of 2009 Huet Vouvray Sec Clos du Bourg the other night, a bottle that a friend brought to a restaurant. It was great, everything you could want from a young Huet. The only other bottle I drank came from my own cellar a few months ago and was not good. Dan Melia drank it with me and we both thought it was overripe, not focused, and unsatisfying. 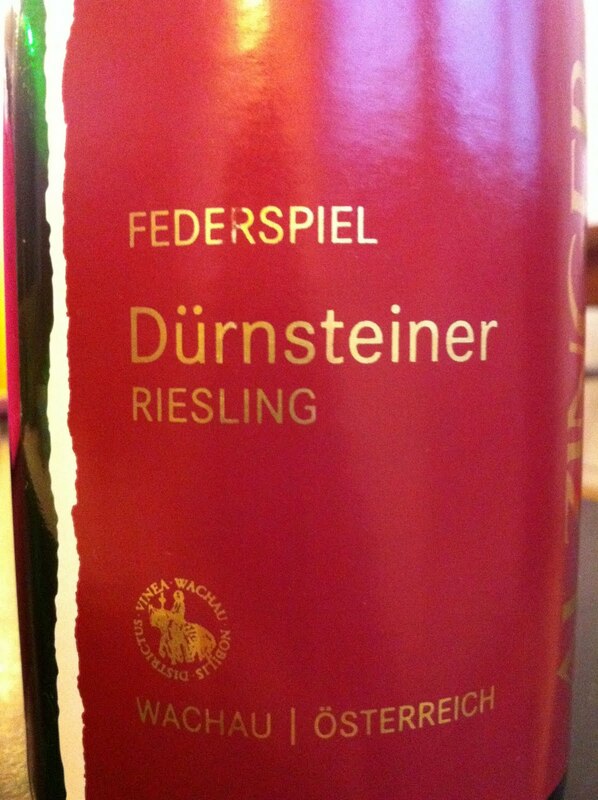 --I drank a bottle of 2008 Alzinger Riesling Federspiel Dürnsteiner the other night. It was fantastic. I decanted it, as I've learned is very important with basically any Austrian white wine, and left most of it alone for about two hours. Delicate fruit, very mineral, perfect balance, absolutely delicious. The bottle I drank three weeks ago, though, was nowhere near as good. 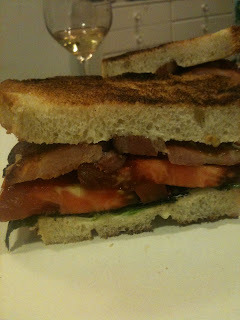 I didn't decant it, and it showed big and ripe and without much detail. 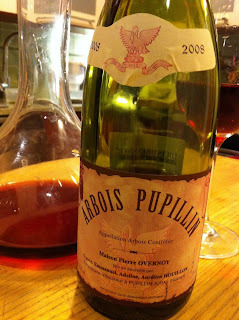 Disappointing enough so that only three weeks later I was ready to cull this bottle from my cellar. Turns out that I wasted the first bottle - the wine is excellent if you handle it correctly, which I didn't do the first time. 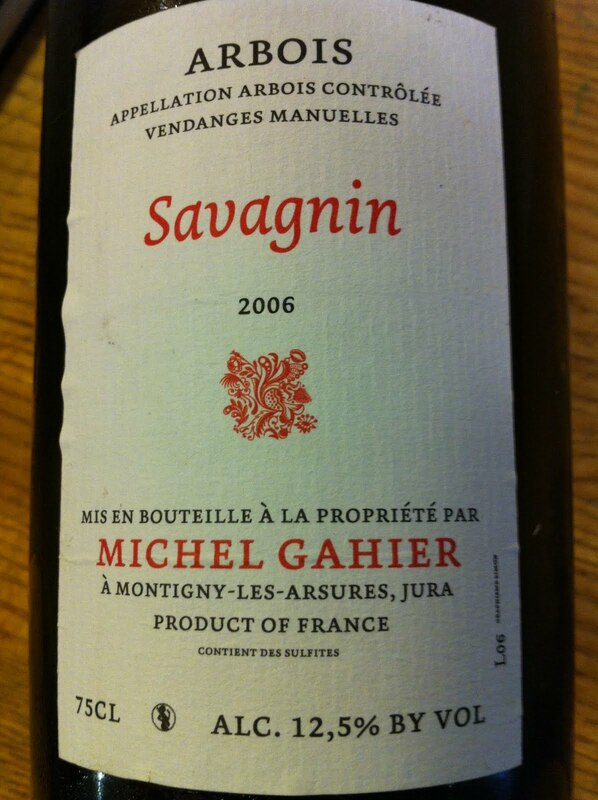 --I drank a bottle of 2006 Michel Gahier Savagnin the other night. A friend brought it to my house for dinner. We liked it, but didn't love it. It was tasty but not complex, constricted, without energy. We re-corked it and moved on to other wines, I stuck it in the door of the fridge and forgot about it. A week later I found it, poured a glass, and it was great! Detailed, expressive, vibrant, completely delicious and intriguing. So what is there to take from all of this? Wine changes from bottle to bottle, and within the experience of drinking each bottle. We as tasters change and grow too. It is foolish to assume that one experience with a wine is the defining experience. Wine ratings that arise from one tasting probably should not be relied upon, unless the critic is one of the incredibly rare people who actually has the depth and breadth of experience to understand the wine in its current state, and extrapolate from that state something meaningful about the wine as a whole. Those people are out there, but they are few. Furthermore, reviews of wine that are based on tasting notes that describe specific flavors such as blackberry, smoke, peach, and things like that, those reviews are completely useless if you care about truly understanding a wine. We are going to like some of the wines we drink. And then we will not like those same wines as much when we drink them again, or vice-versa. This will be disappointing and thrilling, and frustrating. Probably the best thing to do is to have an open mind, to expect your opinions to change, to experiment a bit, to invest in yourself as a learner. I'm still trying to find my way in all of this, and I'm fine with that. Joe Dressner was a rare type of person. He made his living selling wine, but unlike most salespeople, he had no interest in pushing his products or reaching the widest possible audience. He developed this kind of insider relationship with the wine drinking public - if you took the time to get to know his wines, you'd be rewarded. If not, no problem, your loss. In the early '90s Joe believed in wines that no one in America had heard of or tasted, and his combination of intelligence and good taste allowed his business to work, and continues to allow you and me to drink his great wines. Perhaps the most telling thing about Joe Dressner is the incredible devotion and love he receives from his colleagues, many of whom became his close friends. And this was not an easy guy - Joe was simultaneously brilliant, sarcastic, hilarious, emotional, irreverent, welcoming, dismissive, and always complicated. Easy or not, Joe inspires deep affection, respect, and love from an enormous group of people. I cannot say that I knew Joe very well, but I respected him deeply and enjoyed his company whenever I was fortunate enough to be around him. He always treated me kindly and we had several deep conversations over the years that I walked away from feeling as though I had learned something. Joe Dressner died on Friday night after a long battle with cancer. He will be greatly missed. This wine community that we live in is a vastly better and more interesting place because of him. Cheers to you Joe, to a life well lived, and thank you for all that you have given us. 2010 - The Vintage of the Century ! From the little that I have tasted so far, I think 2010 is going to be a fantastic vintage for many of the wines that I love to drink. I'm talking about Beaujolais, Muscadet, Chinon and the other Loire Valley sites. Fantastic in the sense that the wines will be both incredibly delicious and also very much true to themselves, highly expressive of place. Think about these wines in 2009, for a minute. The wines are very ripe, full in body, and I've often thought that they do not express terroir as well as they do in the less ripe vintages. I'm not saying they are bad wines, or that I don't like them, or anything like that. I'm just saying that the average 2009 version of a wine that I typically love turns out not to be a style of wine that I love. 2010, however, seems to be a different story. I remember in the early spring at the Bowler portfolio tasting I spoke with Mathieu Baudry while tasting through his '09s. I told him that I was surprised at how ripe they were. He agreed, and said that while they are good wines, he is extremely excited about his 2010s. He said that they will show a perfect balance of fruit and soil characteristics, great acidity and balance, and a blend of power and grace. That sounds exciting, no? Dan Melia of Mosel Wine Merchant told me that 2010 was a crazy vintage for Mosel Riesling with the highest acidity levels in years. He said that many producers had to de-acidify, and that some of the wines, even from big name producers, might be difficult. The producers who were able to handle the various challenges made truly great wines, he said, and he is very excited about a lot of the 2010s in his portfolio, including wines by Peter Lauer, Weiser-Küntsler, and others. Yes, he imports the wines and is expected to say that he likes them. But if you know Mosel Wine Merchant or Dan Melia, you wouldn't be thinking about that conflict because for them there is no such conflict, he says what he thinks about the wines. Peter Liem in ChampagneGuide.net talks of 2010 as a very difficult vintage with prominent rot and other dreary weather problems. He says that he doubts there will be many vintage Champagnes made. But he also expresses a clear optimism for the vintage, saying that conscientious growers were able to harvest ripe fruit, and if they employed "strict, even ruthless triage" they were able to make quality wines. 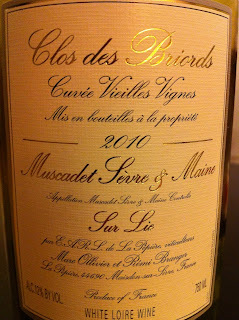 2010 Domaine de la Pépière Muscadet de Sèvre et Maine Sur Lie Clos des Briords, $16, Imported by Louis/Dressner Selections. 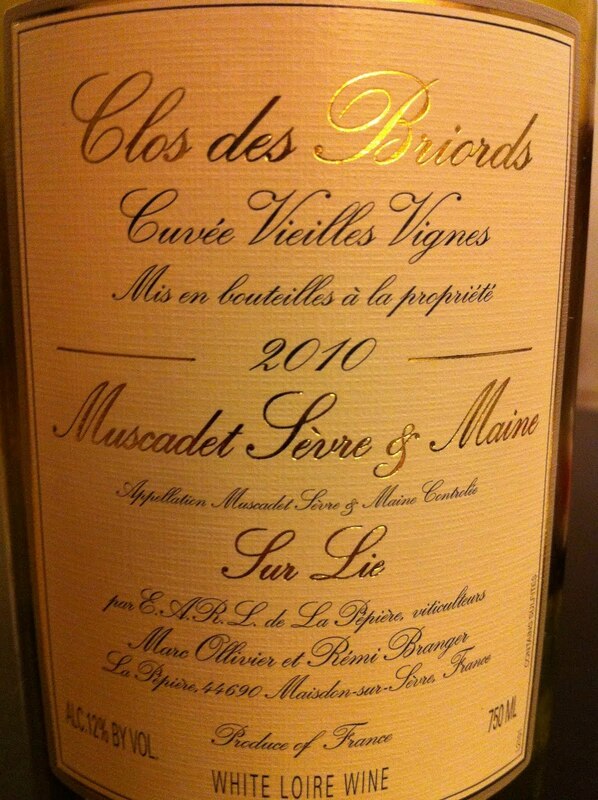 I always love drinking Clos des Briords, but this is my favorite since 2007 or 2004 and I think I prefer it to them. The wine is simply great - it shows a wonderful blend of minerality, fruit, and acidity, everything in balance, and it is vibrantly expressive and intensely focused. Yes, it's a bit harsh now in its youth, but for me, it promises to be completely delicious and is absolutely and unmistakably Clos des Briords. If you like Muscadet, this is a wine to go long on. I have no idea what 2010 will bring in the finished wines of Champagne, in Burgundy, in the Jura, or in the other places I love. But I have high hopes. We are in high tomato season, and it is a glorious thing. I but my tomatoes from a farmer named Bill Maxwell. His farm is about two hours away in New Jersey. 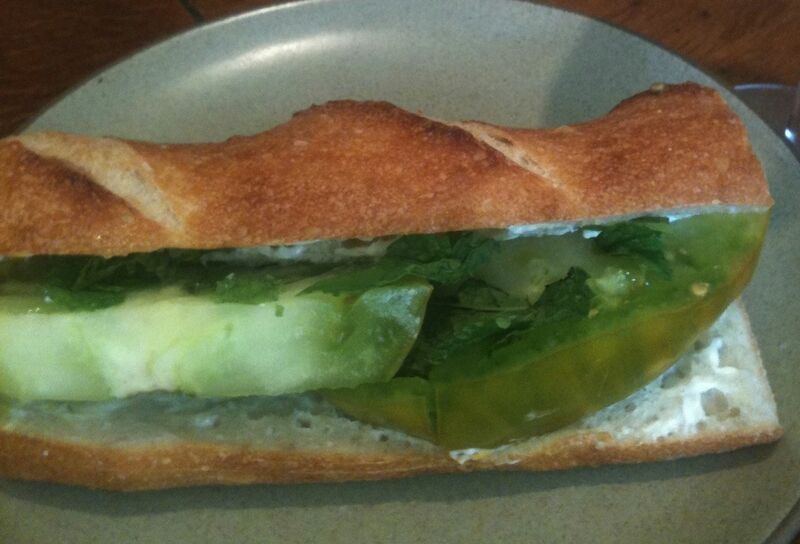 This summer I've been enjoying the tomato sandwich. There's not a lot to it - I like to slice them thickly and place them in crusty bread with a nice wipe of mayo. Sometimes I throw in a little chopped mint. Mint? Yes. I actually prefer it to basil in a tomato sandwich. I love how the bread is waterlogged with tomato juices in the last few bites. These tomatoes are supposed to be green. 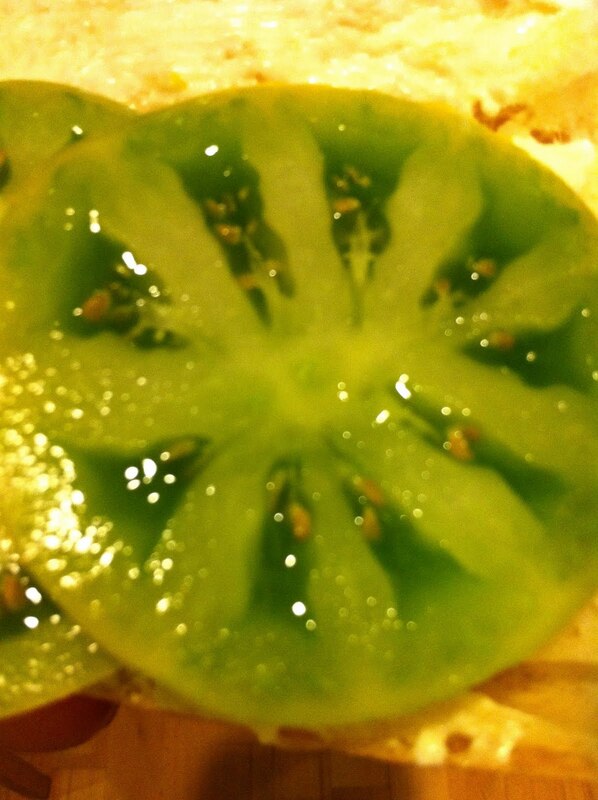 They are Green Cherokees, an heirloom variety. 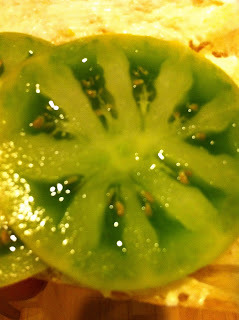 When ripe they are wonderfully tomato-ey and very acidic. So very delicious. Maxwell also grow Ramampos, another heirloom variety. They look like store-bought tomatoes, but they smell and taste great. With a little L and T...fugedaboudit. And there are Japanese Blacks, also heirloom. 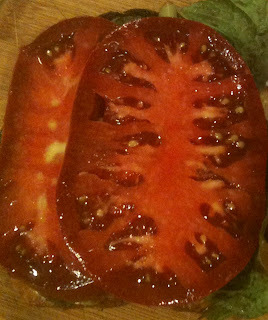 These are lusciously sweet tomatoes with a nice herbal undertone. I love to eat them with nothing more than a pinch of salt. 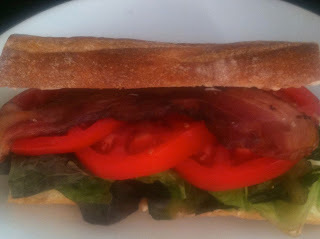 Then again, on a toasty BLT with thick-cut bacon and a glass of fino...hard to argue with that. Thank you Bill Maxwell for your amazing tomatoes!